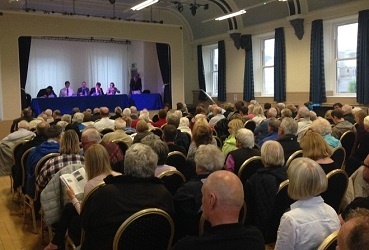 It was standing room only at Port St Mary Town Hall last night, as around 150 people attended a requisition meeting for Rushen constituency. The candidates - Leo Cussons, James Hampton, Mark Kemp, Laurence Skelly and Juan Watterson - were grilled on a wide range of issues by the audience for some two and a half hours. Topics included work capability assessments, abortion laws, medicinal and recreational cannabis, nationalising the Steam Packet, public sector pensions and the MUA debt.